1954: Travels to Tokyo in the autumn of 1954<ref name="kitahara">Kitahara Dohmu. ''Tokyo Fetish Club.'' Tokyo: San'ichi Shobo, 1996. Print</ref><ref group="note">[[Seiu Ito]] and Torirou Miki are considered to have encouraged Suma to go to Tokyo.</ref>. He meets [[Seiu Ito]] in person for the first time<ref group="note">[[Seiu Ito]] and Reiko Kita had exchanged written correspondence for a number of years before this. At first, Itou believed that Reiko Kita was actually a female artist. Moreover, it's said that until the end of his life, Itou pretended that Suma was Reiko Kita's husband.</ref><ref name="star"></ref><ref name="akita"></ref>. 1960: [[Uramado]] changed from edge binding to inner binding and championed the "abnormal magazine." 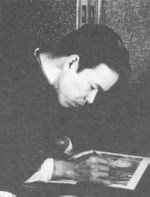 1961: [[Hiroshi Urado]] participated in [[Uramado]]'s editing room. 1962: Passed the editorial baton to [[Chimuo Nureki]], who became [[Uramado]]'s new editor-in-chief. Worked on editing ''Light'' and the girls' magazine ''Lyric Literature''<ref name="akita"></ref>. 1970: Suma and [[Chimuo Nureki]] left Kubo Shoten and founded [[Abu Production]], where Suma was an executive head. They published [[Abument]] which terminated in Sep. 1970. 1970 (November): Involved in the foundation of [[SM Select]]. 1971 (October): Involved in the foundation of [[SM Collector]]. 1989: The documentary video Jouen - The world of Minomura Kou was made by Syoichi Yoshimura. Directed by Haruki Yukimura. Chimuo Nureki, Oniroku Dan, Tetsuro Sakuragi, Go Arisue, Yoji Muku and Syoichi Yoshimura appeared on the video.